By Richard Ziernicki, Ph.D., P.E. National statistics show that fatigued drivers cause over 20% of trucking accidents. Such impaired drivers were the number one cause of trucking accidents thirty years ago and every year since then. Fatigued drivers remain the number one cause today. The more things change, the more they remain the same! In any traffic accident investigation the plaintiff needs to consider three fundamental factors: environment, vehicle and driver. This article will analyze the driver as a factor and specifically a fatigued driver and his or her role in causing a truck crash. How many times have you seen a police report wherein the driver stated to the trooper “I did not see him”? How many times was there no or almost no reaction on the part of the truck driver, e.g., no skid marks, no evasive steering? In the case of a delayed reaction due to driver fatigue, there may be evidence of panic braking or steering way too late, and just immediately before impact. Surprisingly, those responses from truck drivers are all too common for accidents happening at night as well as during the day. What would you think about an accident where the driver of a tanker failed to see and react to slow moving farming equipment with a proper “slow moving vehicle” sign, traveling on the road during the daytime without any natural or traffic obstructions? What would you think if the truck driver had over one-third of a mile of unobstructed view of the farming equipment? In this particular case, the driver of the tanker applied the brakes and swerved less than one second before impact. 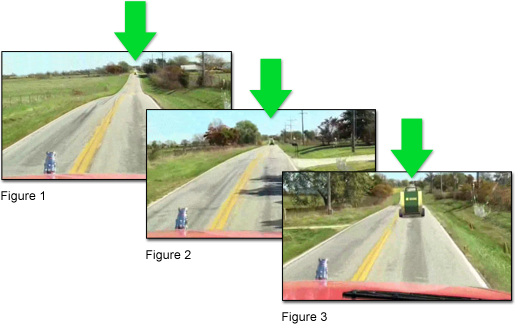 Figures 1, 2 and 3 show computer generated images of the farm equipment incorporated into actual video footage of the accident location. The distance from the camera to the point of impact is 1600 feet, 700 feet and 90 feet, respectively. How would you explain a crash at night, where the semi driver failed to react and plowed at full speed into a passenger vehicle, killing a small child in a child seat? What if the accident took place in a properly signed one mile construction site, with overhead lights and a flagger trying to slow down the trucker? The authors are currently working on a case where a Freightliner tractor-trailer travelling on cruise control at a high rate of speed ran into the back of a Nissan travelling 55 mph at 4:30 am. The impact forced the Nissan down an embankment, causing it to roll several times, killing one passenger and catastrophically injuring three others. The DDEC download from the Freightliner tractor showed that the trucker did not brake until after impact and even then his foot slipped off the brake and onto the accelerator. The driver told the trooper he never saw the Nissan! Clearly he was asleep and no wonder! His nightly route left Atlanta at 6:00 pm, took him to Jacksonville and then back to Atlanta on an all night drive. Who wouldn’t be prone to falling asleep from 3:00 am to 6:00 am when the body’s circadian rhythms demand sleep. There are only a few possible explanations: the mechanical system such as the brakes or gas linkage failed, the driver intended to cause the crash, the driver experienced a catastrophic health problem, the driver was under the influence of drugs or alcohol, or the most likely cause, he was fatigued. Of course, most of the above factors can be investigated since they leave direct tangible evidence. Fatigue, however, does not always leave direct tangible evidence, but can be proven by eliminating the others as plausible causes. Fatigue is a condition which causes the driver to be impaired, resulting in limits to his or her capability as a driver. Perception and reaction time, as well as judgment, are all impaired. Research shows that a fatigued driver is just as dangerous as a drunk driver or a driver under the influence of drugs. What causes fatigue? The main reason for driver fatigue is lack of sleep, but drugs, alcohol and some medical conditions can also cause driver fatigue. Sleep apnea, which commonly affects overweight drivers, can so erode the quality of sleep that even eight hours of sleep is not enough! A fatigued driver will have poor judgment of speed, road conditions, road configuration, road signage and presence of traffic. A fatigued driver will tend to speed, follow too closely, fail to observe roadway conditions and signage, and finally fall asleep, suffering episodes of microsleep and then falling completely asleep. Fatigue will severely affect all aspects of a driver’s reaction, including detection, recognition and the decision making process. It also degrades the driver’s attention level, focus, concentration and ability to properly judge environmental factors such as traffic, visibility, speed and more. Let’s look closely at how the driver reacts and how that reaction is fundamental for safety. An alert driver constantly scans, monitors and analyzes the roadway and the environment around the vehicle. If something is out of order, an alert driver will detect it, will recognize what has been detected, and will make a decision regarding how to deal with it. Finally, the driver will respond by braking, steering or a combination of both. This whole process is called “driver reaction time” and will take anywhere from 1.5 seconds up to 3 or more seconds, depending on the visibility condition (night, fog, black and small objects). Let’s analyze a driver who is fatigued and look at the detection, recognition, decision making and response time. Imagine that all four phases of the reaction are extended only by one-quarter of a second. It will require an additional second for the semi to respond compared to a non-fatigued driver. This means that a semi, at 65 mph, will travel an additional 96 feet without any response from the driver. This one-second delay will mean the difference between stopping just short of an upcoming stopped vehicle or impacting that vehicle at 38 mph. Imagine if the driver’s reaction is delayed by two seconds! The same semi, with initial speed of 65 mph, will travel an additional 192 feet before responding and will rear-end the upcoming stopped vehicle at a speed of 54 mph instead of stopping and avoiding the collision, had he reacted two seconds sooner. What if the driver is going faster than 65 mph…? Delayed reaction time may also erase the time necessary to take evasive action, such as changing lanes to avoid a slower moving vehicle. This is why a fatigued driver might fail to recognize a problem ahead, react too late, brake at the last second, swerve, or simply drift off the road or cross the center line of the roadway, causing a crash. Now we can understand why a fatigued driver will say “I did not see this vehicle in time to avoid this collision” or “I did not see him at all”. Before a crash takes place, vehicles are traveling on the roadway and each vehicle possesses a kinetic energy which is proportional to the vehicle’s weight and proportional to the square of a vehicle’s speed. During a collision, this energy is dissipated and causes crush damage to the vehicles and potentially injury to the vehicle’s occupants. It also “moves” the vehicles from the point of impact to the point of rest. When the dust settles, this energy has been reduced to zero. When a fully loaded semi (80,000 pounds) is traveling on the highway, it has twenty times more energy than a typical passenger vehicle, traveling at the same speed. This energy is the reason why a semi causes so much more damage and injury in motor vehicle accidents. Catastrophic injuries such as brain damage are much more common when tractor trailers are involved. The Federal Motor Carrier Safety Regulations (FMCSR) require truck drivers to reduce their speed by one-third in rainy conditions and by one-half in winter driving conditions. This means the driver should slow down from 65 mph to 43 mph in rainy conditions and to 32.5 mph in winter driving conditions. These speed reductions mean the energy of the semi is reduced to 44% and 25%, respectively, of the initial energy of the semi traveling at 65 mph. Reducing the semi speed by half results in a reduction of this deadly energy by a factor of four. It also has dramatic consequences on a semi’s stopping distance. For example, a fully loaded semi will stop from 65 mph in approximately 280 feet. The same semi will need only 124 feet of stopping distance when its speed is reduced by one-third and only 71 feet of stopping distance if the semi’s speed is reduced by one-half (assuming the same roadway frictional properties). A fully loaded semi on a snow-covered road traveling at 65 mph will need approximately 700 feet to stop! So driving a tractor trailer in adverse visibility or weather conditions without proper speed reduction is not legal under the FMCSR. Now, after discussing a fatigued driver’s reaction time and semi stopping capabilities, it becomes clear why FMCSR requires speed reduction in adverse driving conditions and posts strict regulations regarding drivers’ driving hours. Furthermore, we can see why fatigued drivers “cannot avoid” collisions and cause many catastrophic accidents affecting the lives of many people. FMCSR specifically prohibits “fatigued operator” under Section 392.3. Furthermore, Section 395 limits driving hours and mandates the documentation of driving time. Unfortunately, many drivers disobey those regulations. Why do they do that? Many simply want to make more money by making quick turnarounds of the loads. The more they drive, the more money they make. The drivers and their masters, the trucking companies, routinely put profits before people. Some drivers have done this for years and never get caught, so they continue this practice. In order to drive more hours, they falsify drivers’ logbooks (graph grid), or keep a second or third logbook. “Run for the buck” financially benefits both the driver and the employer. Many employers tolerate and quietly support these practices because they benefit from them too. Speeding, driving too many hours, falsifying logbooks, not reducing speed when required by FMCSR, falsifying employee applications, lying about prior employment, and having unauthorized passengers or second drivers, are all violations of federal law and show a gross and conscious disregard for public safety on the part of the driver. Conscious disregard for safety is the predicate for punitive damages in most states. Some of the violations of the federal law by the driver can be exposed by studying and analyzing logbooks, GPS data, mapping the semi trip (time-space), Qualcomm and DDEC data, phone records, dispatcher records, credit card records, toll records, evaluating employer records and comprehensive depositions of the driver and trucking company representatives. Employers, motor carriers, shippers and leasers are obligated by FMVSS to verify driver qualifications, safety records and employment applications. They should maintain logbooks for a minimum of six months; preserve evidence such as the vehicle, all data recording equipment, and electronic data without alterations and modifications as well as all documents regarding maintenance of the tractor and trailer involved in the accident. It is of critical importance for the plaintiff’s attorney to send out “spoliation” letters to all entities involved by certified return receipt mail. Quite often, they don’t. They spoil the evidence by disassembling or selling vehicles and data recording devices (!) for parts. They adjust and falsify logbooks. They also tolerate drivers driving long hours and they do not enforce company policy regarding safety regulations. They tolerate “bad” driver behavior and fail to terminate the employment when justified. Sometimes they do not have any safety policies. They hire “bad” drivers, without proper employment verifications, including drivers with drug and alcohol abuse, speeding, and accident records. They also push drivers for “efficient” round trips, requiring excessive hours by drivers. All of the above practices are in violation of federal law and have serious safety consequences. Such conduct shows a gross and conscious disregard for public safety on the part of the employer, motor carrier, shipper or leaser. The plaintiff’s lawyer should plead punitive damages, alleging that entire want of care evidences a conscious disregard for the safety of the motoring public including the injured or deceased parties. Extensive discovery should be conducted to obtain documents which may show negligent hiring and retention, failure to train in safety, failure to administer a policy requiring accurate logbooks and driving within maximum hours parameters. Bills of lading, cell phone records, toll records, Qualcomm records and electronic control module data such as from DDEC (Detroit Diesel Electronic Control) data should be obtained. Maintenance records, driver’s daily logs and payroll records should all be obtained. Don’t allow the trucking company to persuade you to forego discovery in return for an admission of liability. All too often the trucking company has something to hide – a dirty driver, falsified logs, a damning DDEC download or records of unperformed maintenance. These factors can all lead to enhanced damage rewards, not only for punitive damages but such evidence has a multiplier effect on general and special damages as well. Plaintiffs’ lawyers and accident reconstruction engineers play a valuable role in society. Together they promote safer highways for the motoring public by not only obtaining fair and just compensation for injured families but also by promoting and pushing for tougher and more effective safety regulations in the trucking industry. In addition, the quest to obtain punitive damages in appropriate circumstances holds the trucking companies and truckers to higher standards of safety and accountability.